Man this was delicious. Also, I have never had occasion to make Dulce de Leche before (tl, dr; put a can of sweetened condensed milk in a pot of simmering water for like 3.5 hours. The end. ), and I could have just purchased La Lechera in the store (we have all sorts of things like that being so close to Cuba and the Caribbean), but why go the easy route? I have almost never taken the easy route. Complication helps me remain intellectually stimulated! Obviously I was not careful about spreading the Dulce de Leche evenly in my tart shell because I was too obsessed with eating the rest of the can of Dulce de Leche. This entry was posted in Baking, Dessert, My Paris Kitchen | David Lebovitz and tagged Baking, Bread, caramel, Chocolate, Cook the Book Fridays, David Lebovitz, Dessert, French, My Paris Kitchen, Tart. Bookmark the permalink. I wish that I have sprinkled more salt! I skimped on the salt as I was afraid it being too salty! 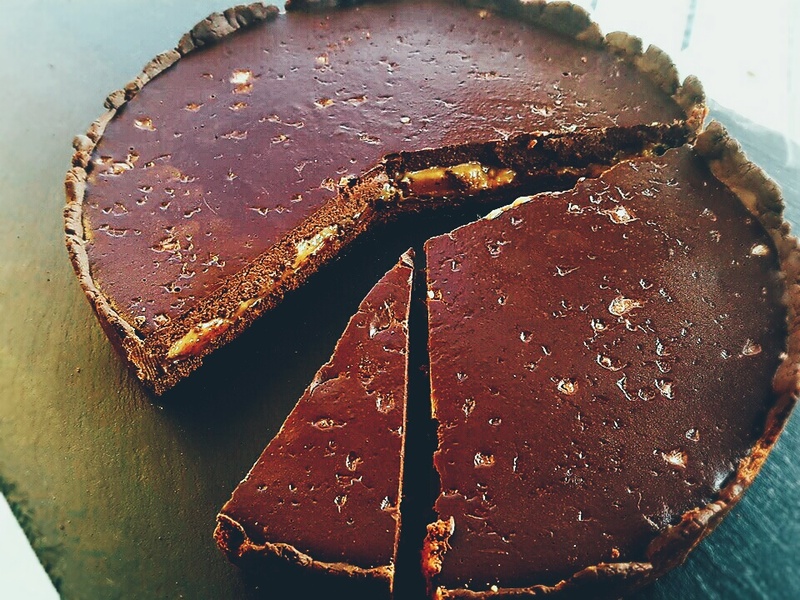 We love this tart as it is not too sweet and it was very chocolaty delicious! I am totally with you on taking the challenge. I still marvel at the idea of turning a can of condensed milk into something else. Magic! Love that glossy finish on your tart. making my own. Since I had the condensed milk I was probably about $7. ahead of the game and the experience was well worth it. Yours looks great and I am sure it tasted as good as it looks. Yes! You could make your own and sell it for a mark up at farmer’s markets… no one would be the wiser! Ha! Uh oh, you had your condensed milk in the water bath much longer than others, didn’t you? What’s up about that? I haven’t made this tart yet but do want to make my own dulce de leche. I agree with your husband…a magnificent brownie. Nice job. I used Pioneer Woman’s guidelines (somehow missed David’s) and it turned out ok so not sure. It was delicious! I think your husband’s description is perfect. This was so delicious. And I really enjoyed learning to make dulce de leche. I did it in the slow cooker for 10 hours. So so simple. I’ll make my own next time – I was short on time when I made this, unfortunately. This was wonderful! Haha, I did the La Lechera thing (due to my relative proximity to Mexico). It was good and I really needed it to be the easy way. 🙂 yours looks awesome and I’ll have to try and make my own dulce de leche sometime! It is good to have options depending on how quickly you need it.